Make this colorful summer tag with Ranger Embossing Powders. Die cut shapes from Shrink Plastic and Clearly for Art. 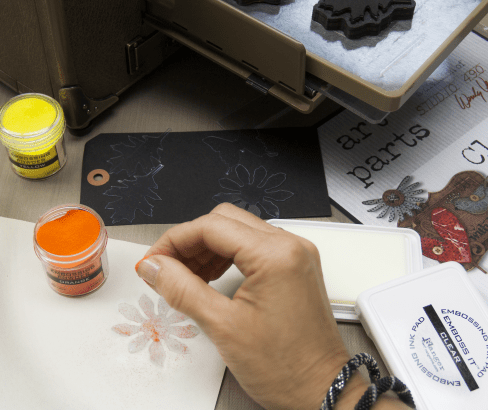 Apply Embossing Ink to one side of the Clearly for Art 9 petal flower. Working over scrap paper, sprinkle a tiny bit of Orange Embossing Powder randomly over the flower. Put excess powder back in jar. Working over scrap paper, pour Yellow Embossing Powder over the flower. Tap off the excess and return to jar.Working over a Craft Sheet, melt the Embossing Powder with a Craft Tool. 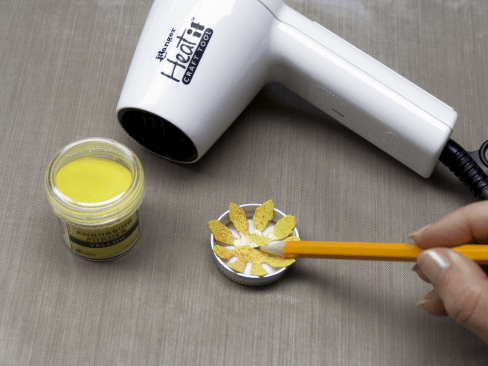 While the Flower is warm, carefully put it inside a metal cap/lid and press down on the center of the flower with the tip of a pencil. If needed, warm the flower with Craft Tool and push again to curve the petals. Let cool. Repeat using Magenta & Orange Embossing Powders with The Clearly for Art 6 petal flower. Repeat with the Light Blue & Magenta Embossing Powder and Clearly for Art butterfly shape. Repeat with the Green & Lime Green Embossing Powder with the Clearly for Art Leaf shapes. (Do not curve these shapes. They will be the stem & leaves of the flower). Repeat with Magenta and Pink Embossing Powder on Shrink Plastic 6 petal flower.Repeat with Yellow and Pink Embossing Powder on the Shrink Plastic 9 petal flower. Repeat with Magenta & Light Blue Embossing Powder on Shrink Plastic butterfly shape. Place the Dina Wakley Plastic Canvas Stencil over the tag. 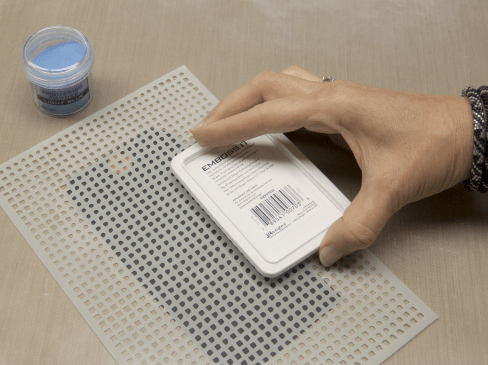 Use the Embossing Pad and tap the ink through the stencil around the edges of the tag. Lift the stencil off and pour Light Blue Embossing Powder onto the inked design over a piece of scrap paper. Return excess to jar. 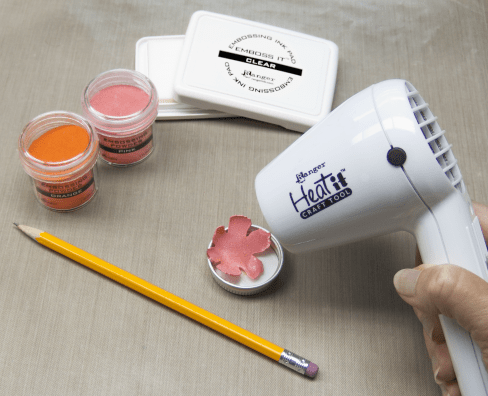 Melt the embossing powder with the Heat Tool. Let cool. Tie a ribbon through the hole in the tag. Layer and adhere shapes to tag with Glossy Accents.